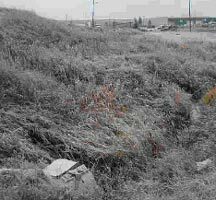 Near Groat Road in west-central Edmonton, Groat Creek and the surrounding ravines were culverted and filled for various road construction projects in the '50s and '60s. Groat Creek itself was completely buried and used as the roadway for Groat Road and to create a city park. Upper sections of MacKinnon Creek have been gradually culverted and paved to build residential neighbourhoods. In the '60s, MacKinnon Ravine was selected for a proposed highway through central Edmonton. 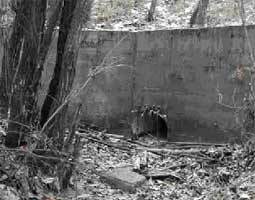 MacKinnon Creek and Ramsay Creek were culverted and the ravine filled, and then smoothed to create a suitable roadbed. This roadway has since become a paved walking / cycling trail. There was significant community opposition to the road construction at the time, and Edmonton Journal archives document protest and community concern about road construction in all of the ravines that were developed during that decade. MacKinnon Creek entering the North Saskatchewan River after being culverted for its entire length. 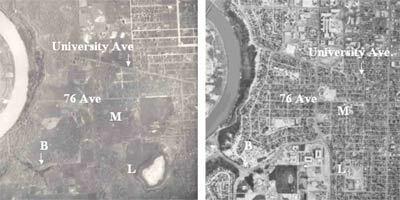 The McKernan Lake area of Edmonton in 1924 (left) and 2000 (right). L stands for Lendrum Lake, which is visible in the left picture, and M for McKernan lake, which was already drained, and whose outline is also just visible. The B denotes Belgravia Ravine, whose creek has been culverted and paved over to create Belgravia Road. The McKernan area of west-central Edmonton is built on what was once McKernan's Lake. This lake covered approximately 30 acres and played an important community role in early Edmonton as a popular skating, curling, and picnic spot. Early maps of Edmonton indicate that this lake was already receding by the early part of this century, probably due to draining for agriculture, and the 1924 air photo shows that it had already largely disappeared. The smaller Lendrum Lake also used to exist in the area. McKernan lake was a popular skating, curling, and picnic spot for early Edmonton. This historical photo, taken in 1913, appeared in the Edmonton Journal. Fulton Creek in eastern Edmonton is a very interesting study area for showing the gradual process of creek loss. Extensive sections of this creek have been culverted while others remain flowing at the surface. Lower sections of the creek were culverted and filled to build the Capilano Freeway and Capilano Bridge; upper reaches are disappearing to industrial areas. A western tributary has disappeared entirely. Fulton Creek flows into the city of Edmonton from the southeast, and first becomes culverted as it enters Weir Industrial Park at 69th Avenue near 50th Street. 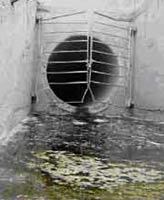 The creek then emerges at 98th Ave and Terrace Road ("Fulton Place" neighbourhood) - a culverted distance of more than 3 kilometres. Fulton Creek flows through a fairly undisturbed ravine for approximately ¾ of a kilometre before going underground again at the Capilano Freeway. The Edmonton area was once covered with an extensive network of marshes and wetlands. An examination of early survey maps of Edmonton indicates that many wetlands and marshes had already been drained by 1924, for both agriculture and residential development, and those impacts continued. Many of today's industrial areas, in particular, were built on top of wetlands. Current City of Edmonton expansion at the edges of urbanised areas are infringing further on these marshes. As a final product for this project, a poster was created. The poster combines the map with photos of the creeks, historical photos, and some information on public involvement in creek protection.